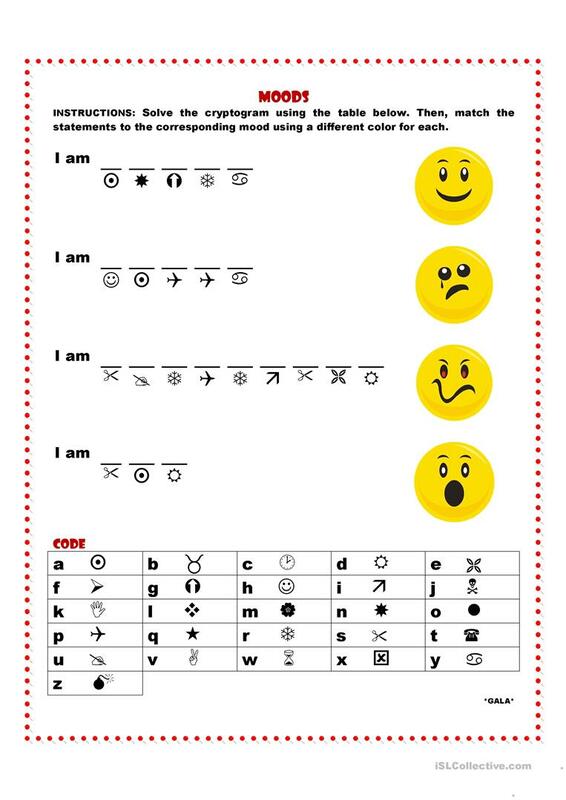 This handout consists of 4 different moods for very young learners. It is a cryptogram they have to solve in order to find out the moods and then match them to the corresponding pictures. Have fun! The present downloadable teaching material is best suited for kindergartners and nursery school students at Beginner (pre-A1) and Elementary (A1) level. It is a useful material for consolidating Adjectives and Adjectives to describe feelings / mood / tone in English, and was designed for developing your groups' Spelling, Reading and Writing skills. It centers around the theme of Feelings, emotions. semiramis is from/lives in Mexico and has been a member of iSLCollective since 2012-04-24 01:00:54. semiramis last logged in on 2012-06-29 07:15:59, and has shared 1 resources on iSLCollective so far.